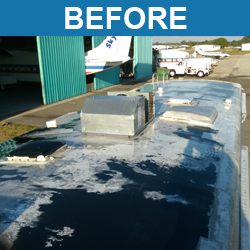 In May of 2016, I researched EPDM coatings and all other systems of RV rubber roof repair. I ended up calling EPDM coatings and they suggested I would need 6 gallons of coating, and since I wasn’t sure whether or not I had EPDM or Alpha roofing on my 36Ft. Southwind by Fleetwood, I ordered as suggested a gallon of primer. 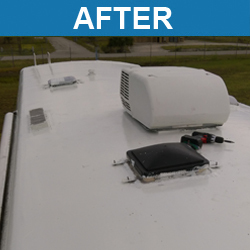 Being old and retired the price of nearly $900.00 was scary until I went to a nearby RV service chain and got quoted $7,000.00 to replace the roof. 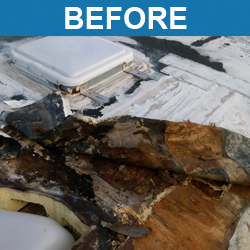 In the accompanying photos you’ll see the roof condition Before we started (we meaning a couple of guys I hired to help. I did tell I was old?) and repairs to soft spots I made (Old not dead) and then the finished product was applied. I didn’t get to do it until this year (May 2017) due to unforeseen circumstance last year. Right after we finished, my wife and I made our annual trek to the state of Vermont to run “Nana & Papa” camp for our 3 grand children. This year, the weather in Vermont was the coldest and WETTEST I’ve seen in a long time. everybody in the campground was complaining about Leaks. OH YEAH, except me, the driest I’ve ever been in my 17 year old motorhome that I purchased used. I have nothing but great things to say about EPDM Coatings and their staff. I still have a unused gallon left and threw out about another gallon. The unused gallon will be for future touch ups (which I’m sure there’ll be). It goes on thick (hire a young and strong boy) when you squeegee the roof out. Get at least a 1/2 inch drill to mix it, and hang onto the bucket this stuff can fly when the bucket spins out of control. Get a lot of vinyl coated heavy gloves. I suggest both Lowes and Home Depot (went thru a pack of each). 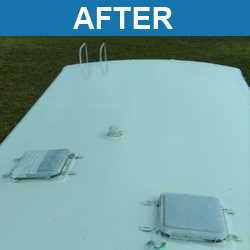 Before you start, clean the roof well, I used “Dawn” & Clorox and a scrub brush and then a light weight (Harbor freight) pressure washer. I would guess my total investment including hired labor was between $1,200.00 and $1,500.00 but it’s the best investment in my motorhome I’ve made. If anything develops I’ll update, so if you don’t hear from me, that’s a good thing. All in all I’m extremely happy we did it and it saved a fortune. Now since the outside looks so good my wife wants the inside redone, it never ends.